‘Champagne’, ‘Bordeaux’, ’Parma Ham’, ‘Parmesan’. Each of these products, associated with certain regions, are renowned and trusted for their nature, quality and authenticity. What is a Geographic Indication (GI)? As a consumer, you are probably more familiar with ‘Scotch’, ‘Cognac’ and ‘Bavarian beer’ than unnamed brands claiming to use the same ingredients. A GI is therefore a labelling that identifies a good as originating in a specific territory, region or locality, where characteristics of the good are associated with its place of origin. GIs are protected by World Trade Organization (WTO) signatories, including all 28 European Union (EU) Member States (MS) and China – since 2001. This is designed to prevent unfair competition and to protect consumers from purchasing goods that misleadingly claim to be from a particular place. China’s middle class is growing as has its appetite for imported – predominantly Western – products. Younger generations spend significantly less time cooking than their parents and are increasingly quality and status conscious. In addition, food safety concerns in recent years have encouraged Chinese shoppers to more carefully consider the origin of the products that they consume. Purchasing patterns have therefore experienced a significant shift. Regarding food, large numbers of Chinese people are purchasing brands that are recognised for their quality and food safety standards. This has stimulated a rise in sales of Western goods. Similarly, while sales of traditional alcoholic drinks, like baijiu, still dominate in many places, individuals in wealthy cities are increasingly opting for higher-end Western wines, beers and spirits. China is now the world’s largest importer of food. 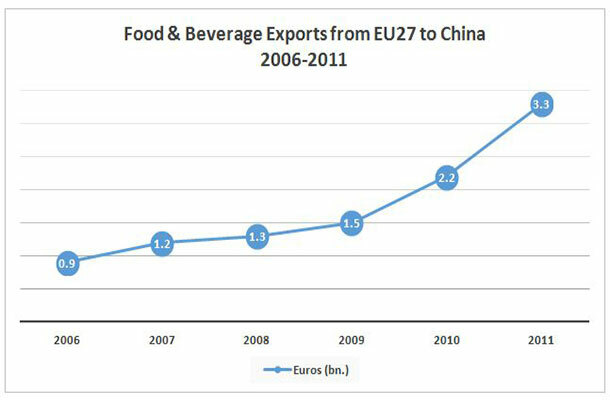 Its exports from the EU grew by EUR2.4 billion between 2006 and 2011, and the food and grocery retail industry is set to expand by 15% annually. The current social and economic climate in the food and beverage industry therefore provides fertile ground for counterfeiters and infringers. If you intend to export products from a specific geographic region, obtaining GI registration can provide necessary evidence of your product’s origin, which will increase trust for your brand among domestic consumers. Contacting your GI organisation: This is the organisation that regulates your specific GI, such as the Bordeaux Wine Council. Your GI organisation can be used to check whether a GI for your product is already protected in China. If it is, you can apply for a User Permit for your product. Recommending that your GI organisation registers the GI as a certification or a collective mark: This step should be used in the event that your GI is not already registered in China. Under Chinese Trademark Law, GIs can be registered as certification or collective marks. Chinese Trademark Law only protects your GI if it is registered. So it is strongly recommended that this is done as soon as possible so as to protect your product from imitation products. A GI can be a geographic name (e.g. “Roquefort” blue cheese), a symbol or logo (e.g. a picture of the Leaning Tower of Pisa), the outline of a geographic area (e.g. a map of Paris), or anything else that identifies a product with a source region. However, if your name or sign resembles a national flag or emblem you need to consult the relevant country’s government. Don’t forget to create a Chinese translation of your GI. To find out why, read our blog post on how to choose a Chinese trade mark here. Further details on registering GI applications and when to use a certificate or collective mark can be found in our comprehensive GI guide. Registering for GI protection at the AQSIQ: For extra protection regarding product quality standards, your GI organisation can register with the AQSIQ. This double approach will ensure that your product receives maximum GI protection in China. Monitoring your supply chain: To be able to enforce your GI rights, you first need to know when your rights have been infringed. Ensure that you are closely monitoring your supply chain to guarantee that your sales staff, distributors and intermediaries are selling your authentic products. Supply chain infiltration can severely harm your reputation and undermine your business. It is also important to be aware of what is happening in the market. If you discover copycat products infringing your GI inform your GI organisation as soon as possible. Hello, this weekend is fastidious in support of me, for the reason that this occasion i am reading this great educational post here at my home. As a devoted representative of the company selling Bordeaux and other wines in China and around the world I can vouch the importance of the GI regulation. It is vital for any firm doing business in China. Its an interesting article. However I wonder how many Melton Mowbray pork pies or Cornish pasties are exported to China! As a general rule if a producer is looking to exploit a product in China, whether or not it has a GI, then the producer should consider registering the brand in China. However, a note of caution - China does not have a robust legal system for enforcing rights in IP against infringement. It is notoriously difficult to bring a successful claim for IP infringement in China. At present China provides outsourced manufacturing services to many leading brands/ manufacturers and as such Chinese companies do not own the IP in the product. This is gradually changing and as Chinese companies own more IP then it will be in China's interest to provide a robust legal system within which to enforce such rights.